As the sun finally sets on another busy August, Ibiza now has only 8 more weeks of ‘summer’ tourism until it’s time to batten down the hatches, count the pennies and relax as international tourism goes into standby mode for almost 5 months. While the blue chip businesses have reported record numbers, others are talking of a steep decline in takings. There appears to be a big swing in fortunes which has taken many by surprise but times are changing and not least the profile of the ‘tourists’ that now grace the white isle. Ever since the ‘low cost’ carriers began flying into Ibiza nearly 15 years ago the type of tourist has been gradually changing and now the cycle is almost complete. The traditional 7, 10 and 14 night family package holiday is now exclusively reserved for school holidays – 1 week in May/1 week in October/6 weeks in August – so out of the 26 week ‘summer’ season there are 18 weeks where families with kids don’t come into the equation. For June, July and September Ibiza still relies on it’s traditional 18-35 market and then a slightly more mature market in May and October. All this has given rise to the Ibiza Weekend Offender – those who are cash rich but time poor, those who pack 7 days of action into a 3 or 4 night stay, those who view a weekend in Ibiza in the same way they view a festival, those who don’t come on holiday but have a ‘weekend away’ so only need hand luggage and most importantly those who spend the same amount of money in 3 days as they would in 7. On closer inspection the average stay has been in free fall since 2008 and we can only presume this will continue as the world gets smaller. The figures suggest that we all want to travel more, to find new and exciting destinations but we also don’t want to miss out on our annual “Ibiza Fix”. So the new profile of Ibiza tourist will now come over for a long weekend and because time is so precious the result is an overly organized trip where the same 4 or 5 venues are visited leaving no time to discover any of the other magnificent places that Ibiza has to offer. Unfortunately spontaneity is almost extinct for the Ibiza Weekend Offender who lives on social media. In fact for some the thought of 7 nights on the White Isle is now almost unthinkable, mainly because their health and wallet couldn’t take the pressure so weekend traffic is considerably higher than during the week. It had to happen sometime – Ibiza has grown up, it sleeps during the week and parties at the weekends. The challenge to local business is how do you convert the near 7 million arrivals into profit as the juxtaposition is that as Ibiza becomes ever more popular it’s the same places that continue to succeed and it’s nothing more sinister than a genuine lack of time for an Ibiza Weekender Offender who can only cram in so much partying and selfies into 72 hours. So instead of seeing the beauty of the island it’s flash hotel rooms, pool parties and super clubs. Sounds great if you are in Las Vegas but surely not if you are on one of the most beautiful islands of the world. So the good news is that Ibiza is at the top of it’s game but the not so good news is that certain sectors aren’t getting their traditional piece of the pie and don’t seem able to react accordingly. Meanwhile the top end gets more exclusive/expensive as the demand grows and the bottom end continues to cater for those who want the experience but not the cost. The bad news is that the middle market again gets squeezed out and when it comes to tourism that’s where the money is for the normal day to day businesses on the island. Guilty as charged to some degree this year for example we are doing 3 trips to the island, 4 days end of May with youngest then we had 2 weeks in August (family holiday) and we are about to have another 4 days with eldest to celebrate his 18th birthday. Also not mentioned in the article was on our August trip the weather was so hot and humid we didn’t explore half as much as we would of liked to, youngest found the heat intolerable so we ended up with more days round the pool than planned. As much as we are not the beach club type our shorter trips (mid week) are planned to a military style precision in advance with set activities and visits to friends, certain restaurants, bars, beaches etc leaving us little time to explore or stumble across new and wonderful places. I have little doubt that Ibiza as it has done for centuries will adapt and survive with this changing market and the growing American and Asia markets may fill the void a little in future years but that will take time to develop. In the meantime businesses with huge marketing and social media budgets will prosper and those waiting for passing trade will continue to suffer. “because time is so precious the result is an overly organized trip where the same 4 or 5 venues ” Absolutely, when on a 5 night stay earlier in the year, every night it was we must have a pre-club drinks at Tropicana, Tropi Trance and Plastik because they are the tried and tested and the people who work their are spot on. Their were other bars but these 3 places were the spine of pre-clubbing. “no time to discover any of the other magnificent places that Ibiza has to offer” Yep, on a 2 week holiday I would get bored being around the pool so a few times I would jump on the bus and go to Ibiza town for a look around, didn’t visit Ibiza town on my last visit. Although, I have noticed I am willing to try more food places for dinner which is surprising as the younger me never thought he would get bored with a KFC where you can add a slice of Pizza Hut pizza to your meal! 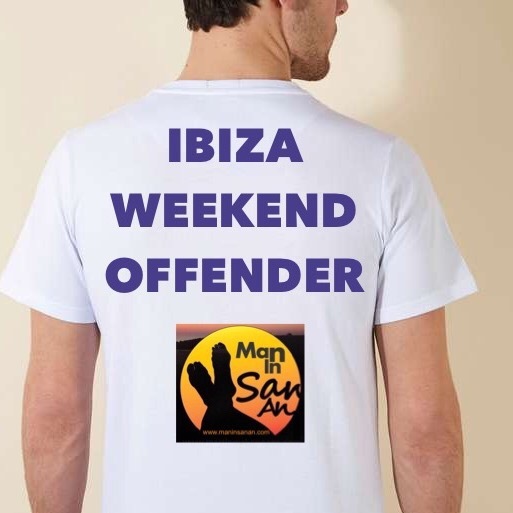 A small but increasing number of Ibiza weekender offenders are the victims of UK airports being to designed to make the IWO start the party in the UK. They do this by making sure the IWO goes to to the duty free shop to buy booze (at Newcastle airport after being searched you walk into the spirit section of the duty free shop! unavoidable). The airport will have the majority of seats in the bar so IWO can get on it like he is living it large in Tropps. Some IWO books their gang into the airport lounge where for £20 the booze is on tap until boarding. You can often spot IWO who have been in a lounge, as on arrival at Ibiza airport they get fast tracked into Ibiza by the Gurada Civil, never see them folk on the return flight though…. With Cream bring it’s closing party to end week earlier than last, as the shortening of the clubbing season continues (Closing parties in August! !WTF) will they look to move to a Friday, Saturday or Sunday for it’s bread a butter of Brits now known as the IWO. Will clubs look to cater more for the IWO by having more Brit friendly nights from Fri to Mon? Who would of thought a Saturday night once known as the change over day, when bars, clubs would let staff have the night off due the drop in numbers would eventually become the centre piece of many peoples holidays. Everyone likes a Saturday night out especially IBIZA WEEKEND OFFENDERS! Great last paragraph. Saturday, for many years, was Ibiza’s quietest night…. Picture this – working in London, leave work Friday afternoon, 10 min bus, tube, cab, DLR down to the London City airport, BA flight to Ibiza on time, free meal, free drinkie to help you relax, picked up by top taxi and ferried to accomodation in less than 2 1/2 hours. Weekend trip less than £300 with accom. and back to work on Monday. In contrast I could leave work, get stuck on the A2, grid lock M25, M20 to Kent Operation Stack, arrive at Kent beach hotel late £150 per night, have half decent meal for £50 per head and its raining. Another thing to consider is the demographics. Younger people are getting fewer, older people from the baby boomers are in abundance. And I lied we did a Monday to Thursday in the height of August at the same price!